Earn up to $520 in First Deposit Free Bets! Bovada is one of the most popular sportsbooks in the US. It is basically a rebranded Bodog and everybody who had an account with Bodog previously shouldn't have many problems to adapt to Bovada. Bovada was previously owned by the Morris Mohawk Gaming Corporation, but in 2015 the license was sold to Salmon River Technologies Limited. Bovada (previously Bodog) has been on the market for almost 20 years and it is rated as a trustworthy gambling partner by the US bettors. Sign up in under two minutes! Follow the link below to activate the offer and create your account. Make an instant deposit using any of the available options. Place your first bet and your free will be credited instantly! Bovada doesn’t support many deposit options; you can fund your account by using your credit card, or Bitcoin. Bovada accepts Visa, Master Card, American Express and Visa Gift Cards that are labeled for “International and Online Purchases”. First credit card deposit is free, while every subsequent Visa and Master Card deposit will be charged with a 5.9% fee. Every subsequent deposit with American Express card will be charged with a 9.9% fee. Bitcoin is the best option for depositing money to Bovada, since there are no fees attached. Only checks and Bitcoin are available as withdrawal methods. Bitcoin withdrawals are free, and Bovada will also cover the withdrawal fee for one withdrawal via checks every 90 days. If you make another withdrawal request during that period, your account will be charged $100. Minimum payout for checks is $100, while the maximum is $3000. Minimum payout for Bitcoin is $20, while the maximum is $9500. Of course, Bitcoin is much faster at processing payouts; you will get your money within minutes, while for checks you’ll have to wait up to two weeks. Bovada sportsbook is well-designed. Popular sports are on the left hand side, while you can find the bet slip on your right hand side. In the upper right corner you can access your profile menu, and you will see featured lines on current events suggested at the top. Navigating through the site is extremely easy and clean design puts them ahead of their competitors. Their mobile betting platform runs both on Android and iPhone devices. The design is very similar to the desktop version of the site, so every bettor who previously used their desktop platform will easily adjust to mobile. Bovada’s betting margin puts them within industry standards. Their odds are not bad, but they aren’t the best in the business either. The major weakness of this sportsbook is their slow listing. For whatever reason, they are usually the slowest US sportsbook to list their games. While this is not a problem for a casual gambler who usually bets right before the kickoff, professional bettors who want to catch some offers early struggle to capitalize on that. Minimum bet at Bovada is only $1, which is another benefit to casual bettors. Bovada welcome bonus is 50% on your first deposit, up to $250. They also have a modern rewards program. The bettors will get reward points by betting on various Bovada markets, which will keep them on the site and make their experience more interesting. 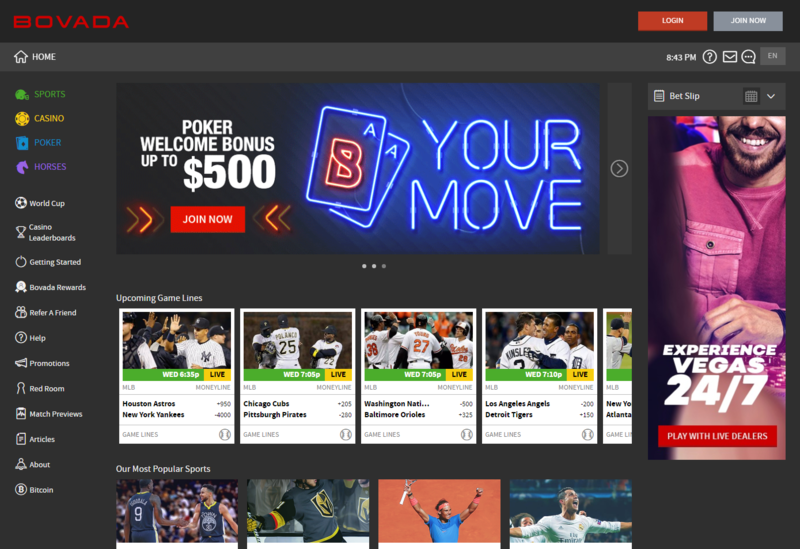 This is probably the best asset of Bovada sportsbook, and one of the main reasons for their popularity with the US audience. You won’t find a better betting partner in the US if you are a casual gambler. Bovada excels at making betting a fun experience. Their welcome bonus is one of the best in the business, but professional bettors will probably have a better experience elsewhere. *State exclusions apply to some offers. Please check T&Cs of each offer with the sportsbook.